Webril Wipes are a 100% pure cotton wipe that contains no fillers, binders or chemicals. The interlocked fibers won't come apart, even when soaked in water or solvents. 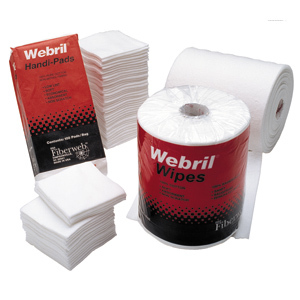 Webril Wipes are soft, lintless, super absorbent, and have amazing wet strength. These wipes are ideal for cleaning, they will not scratch even the most delicate coatings or surfaces. Webril Wipes come in three different sizes. The 4" x 4" pads are packed 100 wipes per package. The 4" x 8" pads are packed 100 wipes per package and are folded to the size of 4" x 4". The 8" x 8" pads are on a roll that has 100 wipes per roll.